It's time for the long-awaited sequel to Trader Joe's Pumpkin Bread Pudding. As Russ pointed out a while ago, other than some notable exceptions, sequels usually aren't as good as originals. And as was mentioned in our most recent podcast episode, bread pudding isn't necessarily what the WG@TJ's team is craving when it's 90+ degrees and extremely humid. This is definitely more of a fall food in our minds. Yet for the sake of our loyal readers, and to be ahead of the Trader Joe's brand food product reviewing curve, we have boldly decided to check it out right now, in the middle of July...because we're intrepid criticasters like that. I just learned that word this morning. Thanks, Dictionary.com Word of the Day. The preparation instructions for this product are very similar, if not identical, to that of the above-mentioned Pumpkin Bread Pudding. There's an optional overnight refrigerator thawing period, and then the preferred instructions have you heating this product in the microwave, although the oven is also listed as a viable alternative. I think the microwave is preferred because there's less danger of overcooking, and therefore less risk of drying out the product. On the other hand, it has recently come to my attention that some people prefer bread pudding to be crispy on the outside. I've never had it that way—TJ's or otherwise. 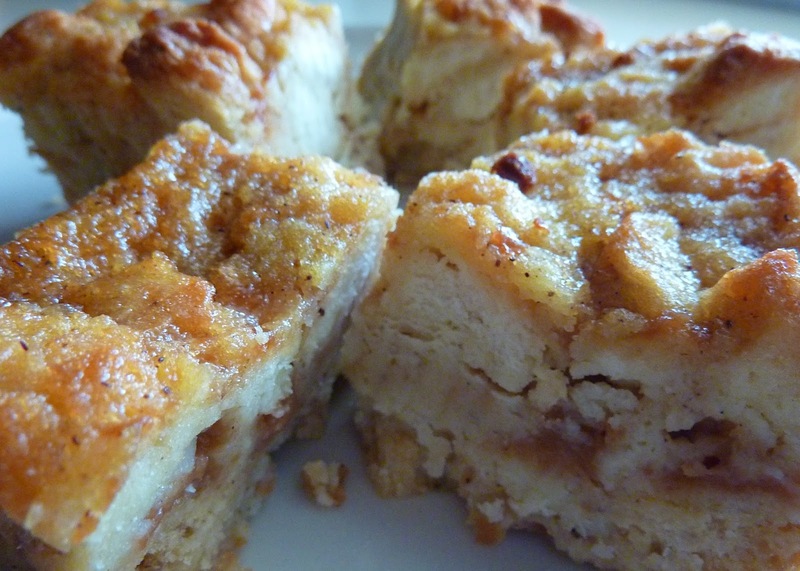 I think the beauty of bread pudding is its unique gelatinous suppleness from top to bottom. And along those lines, this product was moist, soft, and nearly perfect texture-wise, just like its predecessor. That's probably the best feature of this product—that a period of thawing and a few minutes in the microwave can yield such amazingly authentic texture for a dessert that's fairly easy to mess up. I ate one piece straight out of the microwave, and it was great. It melted in my mouth. But like the pumpkin flavor, Sonia and I both agree that refrigerating the cooked bread pudding and snacking on it straight out of the fridge is also legit. What isn't as legit is this product's flavor. Don't get me wrong, it isn't bad at all. But neither of us think it tastes like salted caramel. Sonia says it reminds her more of vanilla than caramel. I just think it's a vaguely sweet flavor, comparable to other "plain" bread puddings I've had. Maybe we were spoiled by the delectable pumpkin spices in this product's forerunner, or maybe we're just used to being bowled over by salted caramel flavor with goodies like TJ's Salted Caramel Gelato or Salted Caramel Chai, but we think the name of this product is slightly misleading in this case. We just want more salt and caramel. Is that too much to ask? What do you think? Each of us gives this product three and a half stars. I just made this yesterday and I completely agree with your review. I could not pick out salt or caramel from the taste, and although it was good, I didn't think it was any different than standard TJs bread pudding. 7 out of 10 for me as well! Good but not great. I threw out the box but it is still in my freezer. Anyone know the over temperature/time to cook it (from frozen state). Thank you.